564 km to Beijing, in China’s Inner Mongolia Autonomous Region, a bridge mimicking a dragonfly-shaped robot is expected to be build. London-based architect Margot Krasojevic has been appointed by the Ordos City government to create the new bridge over the Wulan Mulun River in Kangbanshi district. The bridge will have a flexible structure and a cutting-edge design inspired by the FLIP boat which rotates 90 degrees and floats when in position. 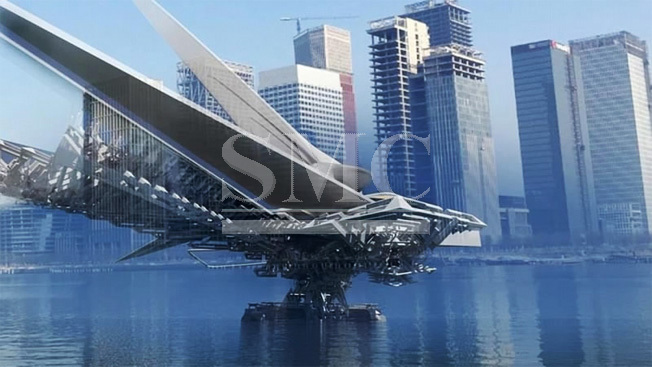 The bridge contains a main floating segment which holds up three wide walkways and a carbon fiber triple sail. The bridge can bend to create multiple sections and then form a stack. It can also support a hydraulic secondary structure which a pedestrian walkway extends from. Krasojevic said that the revolving sail bridge tries to define a new typology for a bridge, which synthesizes movement and flexibility like a yacht. It is said that the “dragon bridge” can be docked along a quayside, sailed into locations along the river or permanently positioned using Caisson foundations, a watertight structure used as a bridge pier. Nine ton anchors and screw-in moorings are also utilized to ensure stability and prevent the complex from drifting away. Krasojevic also added that cities demand adaptable designs from a pop-up restaurant and a quayside coffee shop to cinemas rather than a static and debilitating architectural presence.